Week 6 Reading Comprehension (C-6). Reading segment describing how multiplication and division are related to each other. Cross-Curricular Focus: Mathematics. 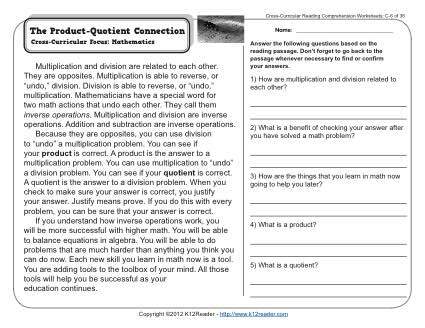 This worksheet is in line with Common Core Standards for 3rd grade Key Ideas and Details, but may also be used for other grades. The passage’s Lexile Level is 700.